Webcam Bad Mergentheim: Market Square - View from the old town hall onto the market square and the twin houses. Lauda-Königshofen: Weathercam Lauda, 6.2 mi. Röttingen: View onto Röttingen, 8.7 mi. Wittighausen: Wittighausen Weather, 9.4 mi. Eibelstadt: Yachting Port Eibelstadt, 19 mi. Rothenburg o.T. : HD Stream Rothenburg, Tourismus Service, 19.9 mi. Würzburg: View from Würzburg-Heidingsfeld, 19.9 mi. 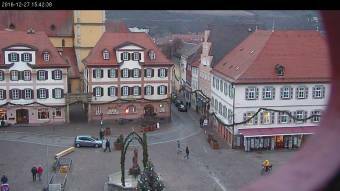 This webcam Bad Mergentheim with the theme Public Places was added on November 12, 2012 and is operated by Stadtverwaltung Bad Mergentheim. It got 7858 visitors since then. Shouldn't this webcam work or should the link be wrong please report that here. You can add this webcam here to myCams.